I put this under mental ism for lack of a better place to put it... Feel free to move it, but if you do I would like access to the responses. Years ago the universe gifted me a handcuff left in a dryer at my local laundry mat, and I promptly put it on my key chain. Alas I recently lost that set of keys (and several small treasures)... Anyways I ordered a replacement set of six cuff keys because it was two bucks more then getting a single key. Being the genius I am I put the one on my keys and lost the rest. Grrrr. Anyways I had grand plans of stashing them everywhere. LOL Outside freeing a few drunks who had handcuffs (and no keys) I have never had the occasion to use them but I think it was Darren Brown who said the best tricks are occur when preparedness meets sheer luck. Should you ever need them and happen to have them on you - You'd be a superhero! Any way there is my motivation. I was surfing the net trying to figure out how to MAKE a handcuff key. The only thing I could find is how to make a shim using a bobby pin or perhaps windshield guts. Hint: Wiper guts are better... but if I am going to make and hide a shim I'd use a small hacksaw blade so I could cut rope or zip ties too. Shims are FAR easier to use but won't open a double locked cuff. I suspect cops ALWAYS double lock them where as generally no one else does, at least no one who imbibes. So here is where serendipity comes in to play... A couple of days I was trolling a thrift store and found a set of wire bending tools with a jig. I have no idea what to do with it but it intrigued me and was priced at two bucks so I grabbed it. Lo and behold one of the many tools is a wire wrap tool that tightly coils a wire and is sized to match my remaining key! I saw post that suggested that if you widen the hole it will fit more cuffs, they also suggest you split the blade. So my thought is to coil the wire to make the column and then use the excess wire on the end to form the blade. For the "Standard key" a coffee stir stick fits over the tool so I can tightly wrap the wire over it and then super glue it as a whole. I am pretty confident that will work for the column... For the the blade I am wondering if I would be better of using wiper guts bent in a "L" pattern. The long leg lining the column and short leg sticking out the end. Two such "L" spaced correctly, would make preferred split blade. I think it would be stronger then using the excess wire, although the blade is short and stout enough it may not matter. In that case it may be better to use wire as it would be less effort to build and less conspicuous on the end of a shoe lace. I ran out of time to follow this up but my pro-type looked VERY promising. 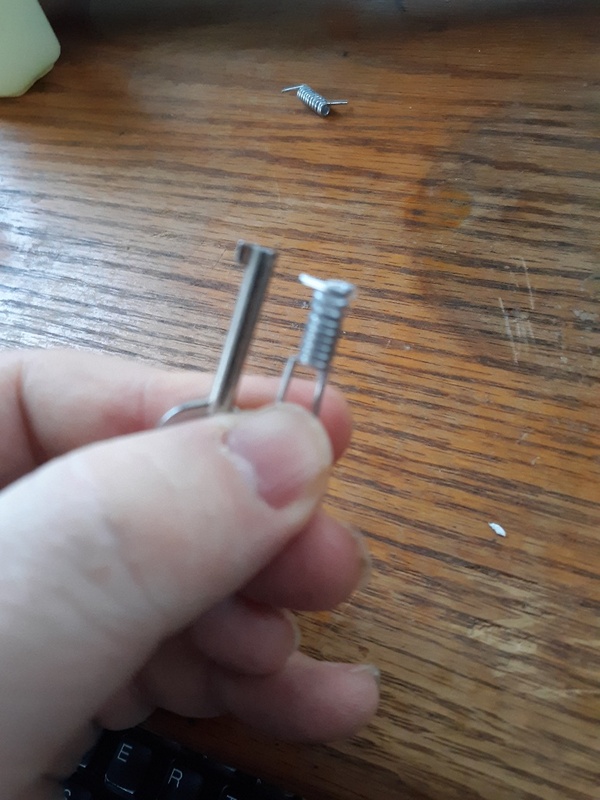 It was super small and very strong ... but because I was using a paperclip, I ran out of wire before I could make the back end. 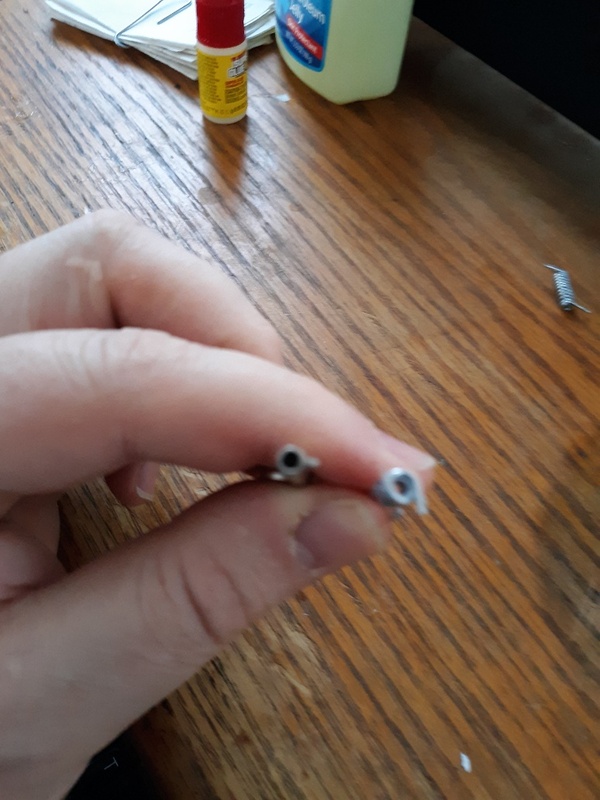 I was able to make the center column and an off center tip. I don't believe The tip being off center will be a problem, I just have to file it down to size. The problem is without more wire to complete the back, the "key" is too small and awkward to handle and turn in the lock. If I can get them working the size will be AWESOME ... The downside is they are metal. I need to get a spool of wire and try again. Til then please stay tuned in! I appreciate the reply (and your public service!) Office David! They are not difficult to make out of sufficiently thick wire and small concealable ones with belt clips are available online. I carry cuffs as part of my shipboard security duties from time to time and am always suspicious of the guy who just happens to have a handcuff key with him. I'm not discouraging you to do it but I encourage caution when picking your audience, the guy who carries handcuffs may become uneasy knowing that you have the ability to get out of them without his consent. I just can't sit still and watch tv ... I have to be doing something and it is usually a magic gimmick of some sort. This go around it is handcuff keys and the like. 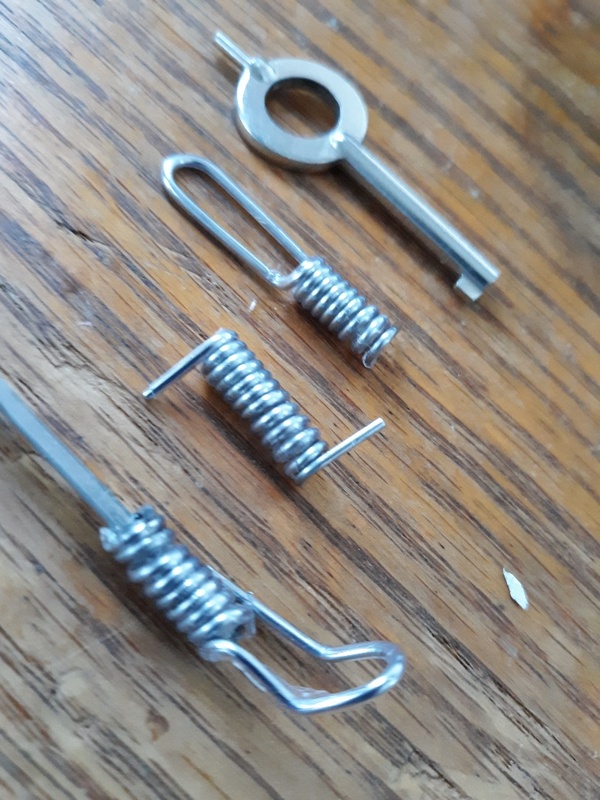 My final prototypes turned out pretty decent ... don't have any cuffs to test them, but outside a little filing of the tip I have little doubt they will work. I got a new phone so I can now take pics. Yippie! They look good, as long as the wire doesn't bend easily when pushed on then I believe you may have the solution. Yeah. The wire will not bend ... coiled that tight and with so short of a tip I do not believe it will be a issue. I am going to sharpen the handle end so they can be used like a hook coin or clipped in clothing and I am off to the races!! Thanks for the input .... I greatly appreciate it.